LAKEFRONT WITH A GREAT BEACH AREA FOR THE LITTLE ONES. A TRANQUIL RETREAT. Wall of windows to view Fall colors reflecting off the water from Kitchen, dining room, living room and master bedroom. Relax on a floating island or connecting tubes during the day and sit around a bon fire by the lake in the evening. Hickory kitchen cabinets and appliances are new with a peninsula that accommodates four stools. Dining has a hickory log dinette. All the conveniences of home. As you walk out of the kitchen, please enjoy your 10'x20' deck with a view. A charcoal smoker/grill is available for you and your guests to enjoy. From the deck, steps lead down to a large grassy area. You'll see a group of blue Adirondack chairs around a fire ring near the waters edge. The beach is fairly sandy and gradually deepens, great for swimming which can be hard to find and safe for children. State Land across the lake so boat traffic is not a problem. Rarely a boat seen. Bring your fishing poles......walleye pike, northern pike, small-mouth bass and yellow perch are ready for you to catch and release, or better yet, make use of the smoker. Have fun and take lots of pictures! Be sure to find my fb page and post them there. SORRY THERE IS A NO PET POLICY DUE TO FUTURE GUESTS WITH ALLERGIES. THANKS FOR UNDERSTANDING. I love upstate New York and miss it very much. I had lived there for 12 years, before that I grew up in Southern California. My family is located in California and Texas so I moved to Texas to be closer to my children and grandchildren. I have 3 daughters, 1 son and 5 grandgirlies. In upstate NY, you can't drive more than 30 minutes before seeing another river, stream or lake. I used to keep a fishing pole in my truck in case I had the urge to pull over and see what I might catch. NY is so obviously different that California (which I love as well). You take life at a much slower pace and enjoy the beauty of being in and around nature. Love at first sight with this property. I used to camp out on the reservoir just up the road from there. On my way home from the campgrounds I had seen the for sale sign and stopped in to take a look. It's hard to find homes for sale in the area. They are typically passed down. Anyway, I stepped in and fell in love with the view. and had to stop in my tracks when I saw the wall of windows facing out towards the lake. The day that I stepped into the home I was hooked, couldn't take my eyes off the lake. When I go back to visit, I find myself instantly relaxing and starring out, just like the first day that I stepped in. The area is in very peaceful location. You wont have to worry about boat traffic so you can relax and let the kids play in the lake. The cabin has a cozy, homey feel to it. I love hanging out on the deck.There's a conversational sitting area on the deck where I sink myself into the love seat to talk with friends over a cup of coffee or a glass of wine. Another pass time that I enjoy is to dip in the lake. In the summer the water is perfect. When my kids would visit, there was always a campfire going. State land across the Lake. Very quiet neighborhood. No boat traffic though you may see a few small fishing boats. Close to two college towns and supplies. Water source is from the lake like many of the cottages. Bring water cooking and drinking. There is an artisan rated well down the road that many of us use. It's better than any bottled water. Electric heaters. Thermostat and heater in master bedroom. Wood stove for chilly nights. Bring beach towels as maid service is not available. Washer/Dryer in basement. Four chairs around peninsula and a hickory table with four chairs. Games and books for your use. Lots of board game provided. Good sized lawn with a fire pit and adirondack chairs. Horseshoe pit. We're on over half an acre. 10x20 feet. Upholstered seating area/love seat, coffee table/ four chairs/huge area rug. Smoker/grill. Bring charcoal. Great View! Hi Rebecca! So glad you all enjoyed your stay! It makes me wish I was back in NY. Happy Holidays to you and your family! Relaxing stay in the Adirondacks. Great place to stay! Easy to book. Owner very responsive with info. 4 adults, with 3 teenage boys, and there was more than enough room for everyone. Very quiet. Lots of stars to gaze at. Place is stocked with pretty much everything you could need. Brought our own kayaks to launch right from property. Everyone could swim, fish and kayak right out front. Boys could go kayaking while the parents could relax in the Adirondack chairs while keeping on eye on them. Plenty of memories. Can’t wait to book again. So glad you all had a great stay! Happy Holidays to you and your family! We enjoyed our vacation at The Shack! The house was exactly as advertised. It was clean and comfortable. My boys loved to fish the river and caught lots of fish easily -- it was their favorite thing to do next to catching frogs in the yard! The water was warm (not very weedy) and was quite shallow at the shore and had an easy grade out -- great for swimming! Not far from the Adirondacks and the 1,000 Islands -- we did alot of fun day trips. A vacation to remember. Thank you! 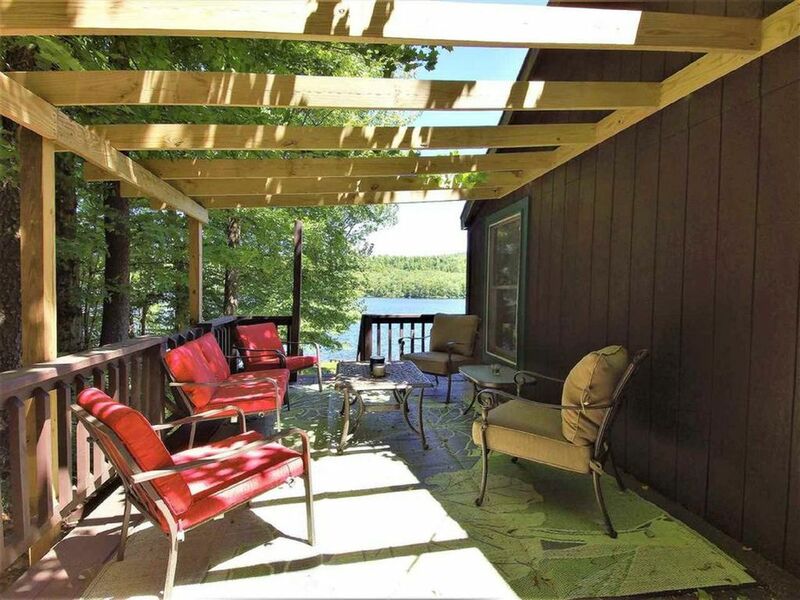 Beautiful property on a quiet lake...perfect place to decompress and enjoy the outdoors! The cabin was very comfortable. We were able to have kayaks delivered right to the cabin. The lake is perfect for kayakingand we enjoyed many paddles. My cousin’s two young sons had fun playing in the water, as did we all! Campfires in the fire pit were the perfect ending to our evenings. A very relaxing get away! Relaxing and great for kids! This is a perfect, spacious, updated waterfront escape! The kids were able to splash around in the water at any time, while we were able to fish at the same time. Perfect body of water for kayaking. Lots of rocky alcoves to explore, including an active beaver lodge. Great photo opportunities! Shade and sun are always easily accessible for lounging in by the water. The kitchen is well stocked with everything you could possibly need to cook gourmet meals; complete with many small appliances, and newer microwave and dishwasher. We also came home with all clean laundry, as there is a washer and dryer at the cottage. The owner insisted we call with any questions or issues, and she always answered her phone immediately. A mechanism in the toilet needed to be replaced during our stay, and she called someone to come and fix it immediately. Wonderful getaway! Had a great time! We fished in the morning, relaxed in the afternoon, did some bike riding, fished in the evening, and relaxed in the house at night. House was nice on the inside. The woodwork looked great. The kitchen was new and nice. Make sure to bring bottles of water as the water in the house is supplied by the lake - not a big deal for us. It was in a nice quiet remote area, but close enough to a small store in Colton (10 mins) and large grocery store in Potsdam (30mins) if you need anything. Glad you all enjoyed yourselves! Weekly Rental Cleaning Fee $175 Late check/Early check in, if available: $15 per hour and must be confirmed with owner before booking. Water source is from the lake like any rural cabins in the area. It comes out pretty clear. Bring drinking water to cook with or save your jugs to fill at the well. The neighborhood uses an artisan rated well down the road. It's better than any bottled water you can buy. No pet policy. DISCOVER CARD NOT ACCEPTED.